After their ground-breaking Concluding Observations recognising IGM as a harmful Practice earlier this year, last week the Committee on the Rights of the Child again tackled IGM practices during the review of Chile in Geneva. Unfortunately, both the NGO and the NHRI submissions failed to document the ongoing practice in Chile, despite the fact that evidence of the three most frequent surgical interventions, i.e. 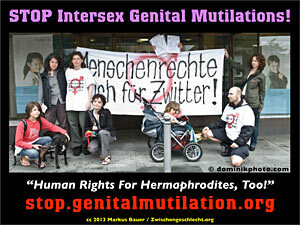 IGM 1: “Hypospadias Repair” (one / two –> poster 29 / three); IGM 2: “Feminising Genital Corrections” (PDF); IGM 3: Castration or “Gonadectomy” (one / PDF), is readily available online. As past submissions repeatedly proved, substantiating the ongoing practice in several local (university) clinics in combination with moving personal testimonies to the lifelong severe pain and suffering caused by IGM is the best chance to get human right bodies to recognise the serious violations of IGM practices. Question was also asked about measures taken by the State party to ensure that intersex children were not subjected to unnecessary surgery without their consent. Therefore, we now hope for strong Concluding Observations on IGM practices for Chile, to be published on 2 October 2015. Chile > UN Committee on the Rights of the Child (CRC) Criticises Ongoing Intersex Genital Mutilations as “Harmful Practice” – Again!